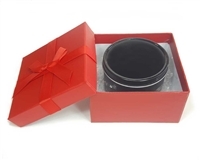 These attractive tins are perfect for gifts as well as storing your bracelets. Most bracelets in the Gemini collection will fit in this attractive tin, as well as beaded bracelets and 1/2" leather bracelets. 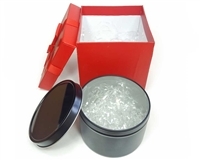 Shallow, seamless, tin plated steel containers with slip on covers and a synthetic cotton insert. They are 1 1/8" deep and the diameter is 3 1/8". They have no sharp edges, all edges are rounded and are seamlessly formed from .24mm metal.